The Mk2 SMSCom Twin Fan Speed Temperature Controller is a slender and compact version of the ever-popular original SMSCom Twin Fan speed controller. Not only that, it's also cheaper and comes with an IEC power cable and socket, making it easier to switch to longer cables if required. The most popular model in the range just got even better! 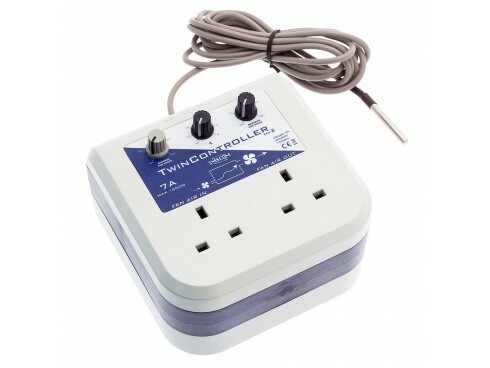 This is the 7A MK2 version of the SMSCom Twin Fan Speed Controller - the most popular of all the model types in the SMSCom range. It has all of the features that made the original such a storming success, regulating intake and extractor fans according to room temperatures. This version, however, is much more compact taking up only 50% of the space of the original! This unit has two sockets on the front (one for your intake and one for your extraction) and 3 controller knobs. The first control allows the user to set a minimum fan speed. This allows the user to set the lowest fan speed required for adequate air exchange in the garden space. The second control on the SMSCom Mk2 Twin Fan Speed Temperature Controller allows the user to set the desired temperature to be maintained. 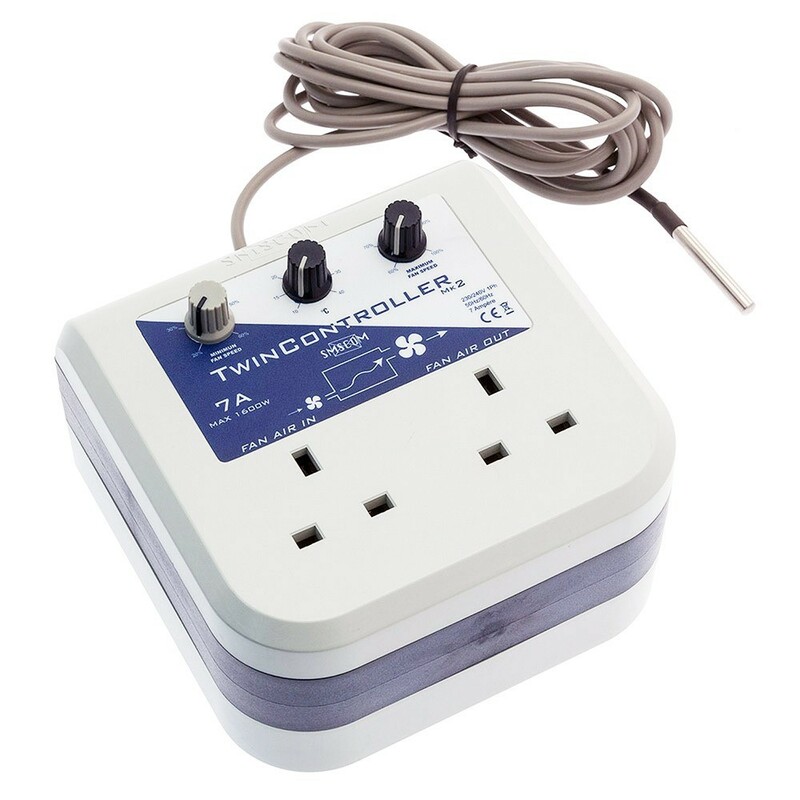 The SMSCom fan speed controller has a temperature sensor on a 2.9 metre long lead which is ready-fitted to the unit. The SMSCom fan speed controller will control the speed of both the input and outlet fans (within the bounds of the min and max fan speed that you set) to maintain the temperature that you set with the temperature control. For this to work, the sensor must be placed in an appropriate position in your grow-space, such as at plant-top height. The third controller knob allows you to set the maximum fan speed. This is particularly useful when using oversized duct fans. If your fan is larger than required for the size of the grow area, you may not want it to kick in at full speed – using the maximum fan speed knob will ensure that this doesn’t happen.